Does your business present positive branding and a great corporate look and feel? Need a quality logo embroidered, screen printed or portrayed in vinyl graphics? Welcome to DigiGraphX, where quality logos come to life using our State-of-the-Art computer software and equipment! We know we must serve you with excellence to earn your confidence and your order. 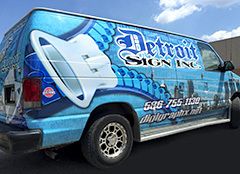 DigiGraphX Company is a family owned and operated Michigan business, founded in 1999. We are a full service embroidery, screen printing, digitizing, vinyl graphics and apparel company, committed to QUALITY SERVICE AND CUSTOMER SATISFACTION. Our state-of-the-art production shop handles all orders, large and small! Our in-house embroidery and digitizing company, operates our own embroidery equipment which allows us to be more Cost-Effective, Produce the Very Best Quality Embroidery, Processing your Order from Start to Finish more Quickly.